Visuals can synthesize information in a powerful, memorable way. At the Graphic Distillery we partner with change consultants, strategists, and innovators to help groups process complex information, generate new ideas, and solve problems. 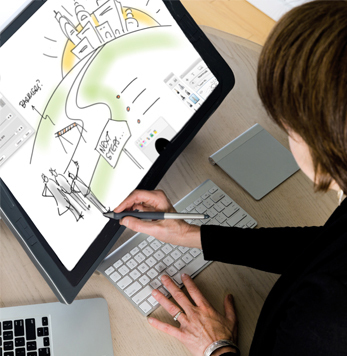 Whether that’s by providing graphic facilitation that captures the ideas, strategy, and vision generated at a live event, or a custom illustration that crystallizes the essence of a presentation, or an animated video that resides on your intranet or website, we provide visual solutions that improve the way your team learns, builds shared meaning, and takes action. When you design and run a strategy session, offsite retreat, or conference, you want to fully engage the hearts and minds of all your participants. Graphic facilitation supports this! 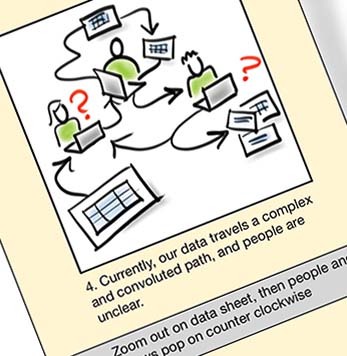 Capturing people’s comments into a synthesized graphic chart strengthens their connection to the work at hand, and improves the quality of the meeting outcomes. Participants are more focused and engaged during the session, and the visual crystallization of ideas stays with them as they go back to work. The charts create a shared sense of momentum, alignment and clarity and allow people to easily share their insights and action steps with others in the organization. 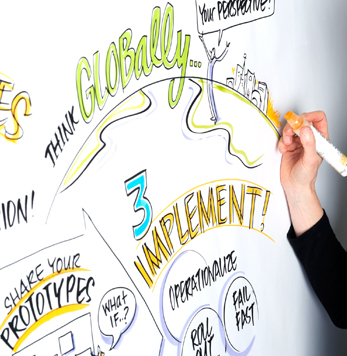 Graphic facilitation allows people to process information faster and more thoroughly. 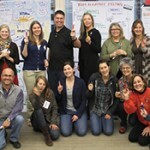 The large visual format allows groups of people to collectively engage and respond to ideas. Teams are able to think through complex ideas to identify connections and opportunities that might otherwise be missed. This process of co‐creation provides a built‐in sense of ownership that helps teams remain engaged as they implement new strategies, products, or services. 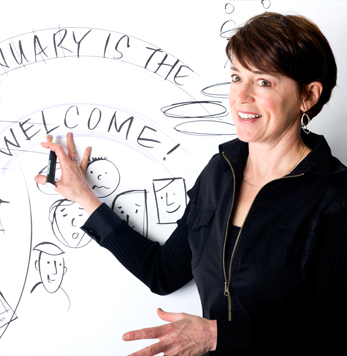 Ready to discuss your graphic facilitation needs? Custom illustrations allow you to tell a story in a visual form. Unlike a linear progression of Power Point slides, an integrated visual can show a whole system or set of ideas, and help people understand where they fit in the big picture. This allows people to make connections between complex, interconnected issues, and can generate excitement about moving forward. The brain processes visuals with text faster & more completely than when the text is presented all by itself. It’s called the pictorial superiority effect. When images and narrative are combined, it increases the ability of audiences to recall and retain information by 42%. Visuals and metaphors also boost retention through tapping into our emotional brain, and can connect with people in a personal and authentic way – engaging hearts as well as minds. Want to help people see the whole picture? As the world gets more complicated, the need increases for “bite‐sized” ongoing education and training. Animated videos provide an engaging way to relay a consistent message or break down complex processes to distributed work teams or potential and existing clients. Video on demand means that all members of a global team can absorb the content when it best suits them. We help you refine your voiceover script and develop storyboards to reinforce that narrative. The outcome is an animated video that will be enjoyable and memorable for your audience. Animated videos combine two out of the three adult learning styles: visual and auditory. (To get three out of three, ask viewers to pick up a pen and take notes. That will activate the third learning style, kinesthetic.) These videos are typically one to three minutes long, an ideal length that allows for easy absorption of new material. Many of the videos we have created are for internal corporate use only, but please look below for a few videos we’ve created that are non‐proprietary. Need artwork for your animated video? More than ever, success in business depends on equipping teams with the tools they need to think creatively and work synergistically. Learning how to think and express yourself visually can help to inspire new ways to ideate and transform your meeting into a collaborative process that engages the entire team. Representing concepts visually can clarify thinking and speed up collaboration. This workshop teaches the basics of visual language, where drawing becomes a thinking tool that allows for quick iteration, prototyping, and sharing of ideas. Participants will learn how to draw a variety of simple icons and different ways to structure and sort information on the page. Through this process, they will learn how to generate ideas by themselves or in a group, and how to access another thinking style to unlock their creativity. Want to make their presentations “stick” in their audience’s minds. Next time you jump up to the flip chart, or run an internal session, wouldn’t it be nice to have a few techniques up your sleeve? 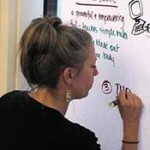 Participants will learn simple principles that will make their flip charts easier to read and more effective. We’ll show you the essentials you need to know about color, lettering, and how to draw easy icons and headings. When you capture a group’s thinking, how can you distill the main messges? Participants will improve their ability to listen for the key points of a presentation or discussion, and learn methods to sort and group information in real time on larger format paper. 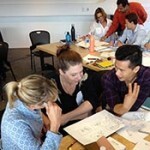 As in the Visual Thinking Workshop, participants will learn the basics of visual language, so that they can build a “toolbox” of icons and simple graphics they can use to clarify the information on the charts they create. Interested in expanding your capacity to capture information visually?